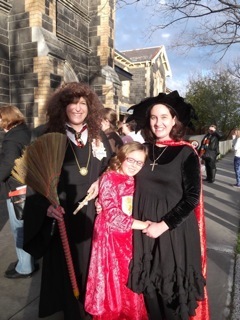 On Sunday, June 30, the Third Annual Service of the Church of Latter Day Geeks was held at Williamstown Uniting Church – Electra St. These were the readings, and this was the ‘sermon’. A reading from the seventh book of Harry Potter, Harry Potter and the Deathly Hallows, from the chapter ‘The Battle of Hogwarts’. But her final words were drowned as a different voice echoed throughout the Hall. It was high, cold and clear: there was no telling from where it came; seemed to issue from the walls themselves. Like the monster it had once commanded, it might have lain dormant there for centuries. ‘Give me Harry Potter,’ said Voldemort’s voice, and none shall be harmed. Give me Harry Potter, and I shall leave the school untouched. Give me Harry Potter, and you will be rewarded. Before Harry could speak, there was a massive movement. The Gryffindors in front of him had risen and stood facing, not Harry, but the Slytherins. Then the Hufflepuffs stood, and, almost at the same moment, the Ravenclaws, all of them with their backs to Harry, all of them looking towards Pansy instead, and Harry, awestruck and overwhelmed, saw wands emerging everywhere, pulled from beneath cloaks and from under sleeves. We will live as the community of Christ. A reading from the second book of The Lord of the Rings, from the chapter ‘The Ring Goes South’. ‘Then I cannot help you much, not even with counsel,’ said Elrond. ‘I can foresee very little of your road; and how your task is to be achieved I do not know. The Shadow has crept now to the feet of the Mountains, and draws nigh even to the borders of the Greyflood; and under the Shadow all is dark to me. You will meet many foes, some open, and some disguised; and you may find friends upon your way when you least look for it. I will send out messages, such as I can contrive, to those whom I know in the wide world; but so perilous are the lands now become that some may well miscarry, or come no quicker than you yourself . ‘The Company of the Ring shall be Nine; and the Nine Walkers shall be set against the Nine Riders that are evil. With you and your faithful servant, Gandalf will go; for this shall be his great task, and maybe end of his labours. We will live as the friends of Jesus. A light to our path. I love the story of Buffy the Vampire Slayer. When I was having a hard time working on my PhD thesis I would come home and curl up on the couch and watch her stake vampires and slay demons and everything would seem to be okay. I’m not sure I would have survived the horror that is a PhD without her. In the very last episode of the TV series Buffy decides that she’s not going to be the only Chosen One around, and with magic wielded by the very awesome witch Willow, calls every single potential Vampire Slayer at once. The creator of Buffy, Joss Whedon, is proudly feminist, and that comes through in Buffy’s speech to her troops: ‘From now on, every girl in the world who might be a Slayer, will be a Slayer. Every girl who could have the power, will have the power. Can stand up, will stand up. Slayers, every one of us. Make your choice. Are you ready to be strong?’ And they are. The crew of the Starship Enterprise; the crew of the Firefly-class transport ship Serenity; SG-1; all work it out much more quickly. If you’re going to save the world, or the universe, or just keep flying, you need a team. That’s why Nick Fury assembled the Avengers. I’ve argued that Sci Fi and Fantasy show us the importance of community and friendship; since we’re here in a church worshipping God it won’t surprise you that I’m also going to argue that as a community of friends is the particular way that Christians are called to live out our lives. Among his many other roles and identities, Jesus is an example of the ideal friend. Jesus’ ministry was about befriending others. He related to those around him as an equal. His relationships were relationships of mutuality: he accepted food from those he helped (Mark 1:31); he allowed himself to be ministered to by women (Mark 14:3-9); and he was willing to have his mind changed by others (Mark 7:24-30). We see in his relationship with Peter a friendship in which mutual love overcomes mutual exasperation and Peter’s misunderstandings. And in the Gospel According to John, we see a friendship in which there was no exasperation and misunderstanding to be overcome; the relationship between Jesus and the Beloved Disciple. Jesus acted as an ideal friend as his world understood it. In a world full of hierarchies, and people with power over others, friendship stood out as the only relationship based upon equality, a relationship of reciprocity and mutuality. Socrates saw friendship as subversive, because it existed regardless of rank. Marriages at the time were definitely not relationships of equality; society was stratified along class lines, with patrons and clients, and masters and slaves. Friendship was the only model of equality that the ancient world knew, and it’s friendship that Jesus offered his disciples. In the reading we heard today, Jesus tells them: ‘I do not call you servants any longer, because the servant does not know what the master is doing; but I have called you friends’. And so the Christian community is made up of the friends of Christ, who are also called to be friends of each other. It might be hard for us to be friends with every other member of the church, we’re all so very different – but if Ruth and Naomi can manage friendship, we can. The love between Naomi and Ruth was profoundly counter-intuitive, they were Jewish mother-in-law and Moabite daughter-in-law; and it demanded great sacrifice from Ruth, who left her own country and her own people to accompany Naomi to Judah. We might not be able to be as good a friend to others as Jesus was and is, but we can definitely follow the examples of Ruth and Naomi. I’m going to quote an author to whom I don’t usually turn. In his encyclical on Christian love, Pope Benedict the 16th argued that the reason we can love our neighbours, even when they’re people we don’t know or people we don’t like, is because we see them from the perspective of Jesus Christ and ‘His friend is my friend’ (Deus Caritas Est, 18). I frequently disagree with Pope Benedict, but here I think he is absolutely right. We are Jesus’ friends, and through him friends with each other. Jesus gives us an example of what friendship looks like; and so do the vast majority of superheroes, as we’re about to see. Because just in case you weren’t convinced by all my eloquence on the importance of having a community around you if you want to save the world, you’re going to see the argument made again in video form. Sit back and enjoy. This entry was posted in Church of Latter-Day Geeks, Random Musings and tagged Buffy the Vampire Slayer, Church of Latter-Day Geeks, Doctor Who, Harry Potter, Lord of the Rings, Smallville, Spider-Man, Williamstown Uniting Church. Bookmark the permalink. Avril – I’ve been following your Church (the geek one!) since I saw you on Adam Hills in Gordon St (wow a couple of years ago now). I’m not even slightly religious in the traditional sense, but you’ve beautifully summed up why I love science fiction. I’ve seen everything you talked about in your sermon, and those themes of friendship and community that spring up in all forms of sci fi and fantasy are so wonderfully articulated in your examples. I’m going to reblog this – beautiful work. Jenna, thank you so much for the lovely comment. These services do seem to appeal to the ‘not even slightly religious’; I have a few atheist and agnostic ex-college student friends (I was their tutor) who come along every year for their one visit to a church. But, yes, absolutely! Sci fi and fantasy have fabulous themes and messages. I’m going to be a guest on a Doctor Who podcast in July and I’ll make a smiliar point there – there’s so much that’s good and encouraging and worthwhile in the genre. And the minister in me appreciates that as much as the fan does. Yes! Like that speech of Rose’s at the end of ‘The Parting of the Ways’, where she goes on about it not all being cool, and dashing about and saving the world, its just hard, and making a stand and doing whats right even when there’s no reward, and you’re likely to get hurt. Such an inspirational sentiment and so widely applicable (especially for believers or non-beleivers in some parts of the world). I can’t wait to hear your Who podcast! I’ve mentioned previously that I’m a sci fi geek, so after seeing this post/sermon transcript I just had to reblog it. Avril is a Christian minister, and a sci fi/fantasy fan, and established the Church of the Latter Day Geek a few years ago with the support of Australian comedian Adam Hills. Both of these lovely people are worth a look (and head to one of Adam’s shows if he’s ever in your area!). Enjoy! This is great. Can you post the video? What a wonderful new perspective. Thank you. Thank you for your thanks! I love bringing theology and pop culture together – and luckily for me my church lets me do it.